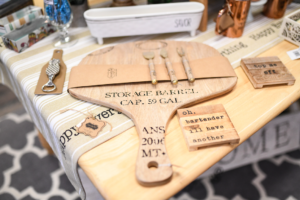 Over here, we’re getting giddy just thinking about all of the bright colors, floral designs, coastal décor, and extra snazzy wedding gifts that will grace the shelves of Whims & Whatnots this spring. 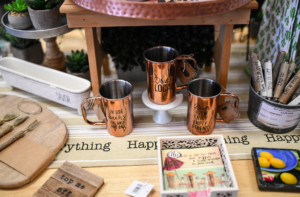 As a specialty gift shop in Greenland, New Hampshire, Whims & Whatnots prides itself on finding unique products for every occasion that can’t be found everywhere. 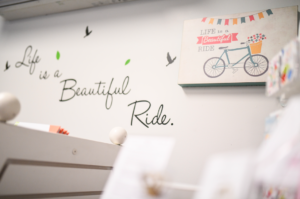 In addition to Owner Jodi Klapes’ year-round offerings that include a tasteful selection of hostess gifts, jewelry, fashion accessories, baby items, greeting cards, stationery, home décor and seasonal items, this spring, her charming boutique will welcome some new brands and product lines as well! A soy candle line with fresh spring scents packaged in beautiful tins. Ooooh…. Ahhhh…. Lots of bunnies (including chocolate ones—our favorite!!). Sweet and unique greeting cards for every occasion! (Some cards are made by local artists)! On April 11 (this coming Thursday! ), Whims & Whatnots will host a Spring Fling Benefit Night from 5:00 – 8:00, in collaboration with a new local nonprofit called Step Up Parents. The organization offers financial assistance to grandparents and other relative caregivers who have stepped up to raise the children of loved ones struggling with addiction. A portion of the evening’s proceeds will be donated to the organization. 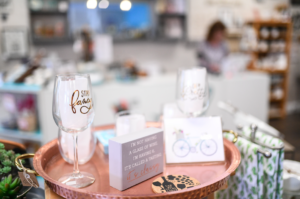 On April 11, all guests can enjoy tasty refreshments, view new spring arrivals, enter the raffle for a chance to win a Spring Fling Gift Bundle, and receive a free gift with purchase!